Comfort is key priority for wheelchair users and we are on your side when it comes to providing it. Choosing the correct chair is a very important decision and you need to ensure that the one you are picking is going to be the perfect fit for you and your needs. You will want a wheelchair that is going to provide you with the finest comfort and also pressure relief. When picking your wheelchair, there will be a certain amount of factors that will determine what type of chair you go with. These factors include your reason for using the chair, diagnosis, body type and your transportable needs. Other factors may include the use of the wheelchair inside or outside the home, your strength and if you need a self-propelled, transit or amputee. While all of these factors need to be considered, there are options to give you extra accessories like adjustable height for the seats, cushions, head rests, bags and holders for your walking aid which can be handy of you only use your wheelchair for fatigue. Self-Propelled Wheelchairs allow you to wheel yourself with their large wheels using your upper body strength. They are ideal for short journeys, steering them with your upper body strength. Travel Wheelchairs are aluminium chairs that are designed for short distance travel both inside and outside like trips to the shopping centre, hospital visits, the airport etc. Transit Wheelchairs have handles on the back to allow a carer or family member to take control of pushing and steering the wheelchair. Different features that will influence you when choosing your wheelchair. These features can differ from footrests and armrests to anti-tippers on your wheels, the weight of the chair and the weight capacity it will hold, the look and style and comfort. Most wheelchairs will be foldable, making them transportable in car boots which is a very important feature for users who still drive or need to be transported by public transport. 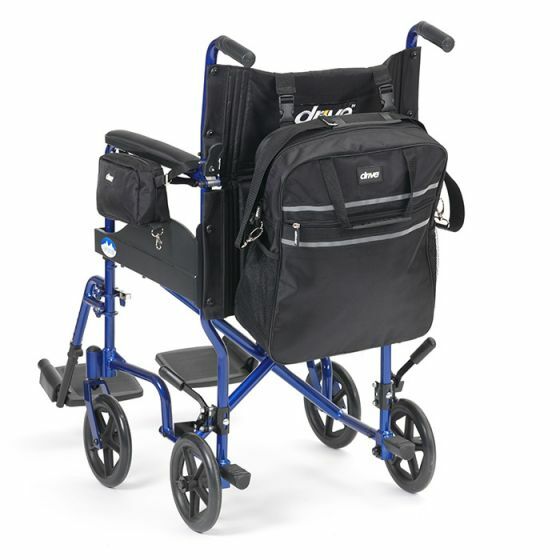 Some the Excel range also have a fold down back which make a folded wheelchair smaller for transporting. The majority of our wheelchairs have footrests that can swing away to be moved out of your way so you can be closer to the wheelchair when stepping into it, this also makes it easier for you to get out. If you have to be assisted in getting in/out of your wheelchair, the swing footrests also make it easier for the carer so they can step closer to the chair. These footrests can also be detached for when a chair needs to be folded, making it more compact. The Excel range also have adjustable armrests which can be lowered to fit under a table/desk if you need to move closer to them. Wheelchairs come with an ‘anti-tip’ safety feature, making them safe to be used by children or adults. This safety features will stop you from tipping backwards with the extended bar beside the wheels. If you are tipping over, the bar will hit the ground and act as a support for your chair, holding it up. The wheelchairs also have a stepper at the back of the wheelchairs which can be used by the person steering it while you’re in a transit/travel chair. These steppers are bars across the back of the chair that the user can push their foot on to raise the front wheels of the chair, to allow it to access kerbs or bumps. A large decision that a person in the wheelchair will have to make is what they want their chair to look like. Although the majority of chairs will have steels/aluminium wheels and outer bars, they can also be very stylish with some coming in different colours, orange, red, blue and green. While these are all features to consider, your comfort will be the biggest of all. The travel wheelchairs will have the less comfort as they don’t have built in cushions because of the size needed to make them compact for folding up and putting into the travel bags. The majority of the self-propelled wheelchairs will have padded back, seats and armrests. The level of padding in each chair will be different, some will come with adjustable deep tension levels in the seat and backs and other will just be generically padded. Our wheelchairs are crash tested, and this is something everyone should be considering when looking for a wheelchair. A crash tested wheelchair means it has been verified that the wheelchair can withstand the force of frontal impact. A wheelchair that has passed a frontal impact crash test at an average of 30mph, means it has the strength to provide effective support when faced with a range of possible crashes. Buying a crash-tested wheelchair will provide you with the peace of mind that you have purchased a safe and reliable chair that can protect you in certain situations. Our Wheelchair Accessories range is extremely diverse and has something for everyone from cushions to headrests, walking cane holders and capes to protect you from the rain. Our wide variety of Gel Cushions come in a range of sizes and styles and provide maximum support and comfort. The gel cushions also come with different amount of gel layers so you can find one that will be suitable depending what your use for a cushion is, if it is just for comfort or to treat pressure sores. A headrest can be added to the majority of wheelchairs that have push up handles. They add extra support to the neck and head and maximise your comfort. Our Wheelchair Cane Holders can be clipped on to the rear tubing of a wheelchair. They will hold a walking stick/cane or a crutch in the upright position. These are popular with people who may only need wheelchair support for fatigue but still have the ability to walk with a walking aid. Our mobility bag set can offer storage to a wheelchair, with their bag clips securing a strong hold for the bag to the wheelchair. The large bag can be used as a rucksack or carry bag while the smaller bag, which clips inside the larger one, can store your personal belongings like a purse or phone safe. With our Irish weather, we can never be too prepared for the four seasons, and our wheelchair cape with sleeves is an extremely light weight cape that still allows you to use both of your arms which is helpful for people in a self-propelled wheelchair. It keeps you safe from the wind and rain with the hood and shower proof nylon fabric. Or if you just want to keep your hands warm while someone else takes control of your chair, our handmuff will keep your two hands warm with its fleece effect inside and elasticated cuffs to keep the cold out. For any more information on wheelchairs or wheelchair accessories, you can contact us (0818) 277 496 or via email on info@beechfieldstairlifts.ie.